Translated by Albert Tootal and annotated by Richard Francis Burton. It was my fate during nearly three years, between November 10th, 1865, and July 28th, 1868, to endure exile as H.B.M. 's Consul for the port of Santos, in the province of S�o Paulo, the Brazil. There was little occupation on high days and holidays, except to visit the sea-board and �kitchen middens"; and, as there are no roads along the shore, many of my excursions were made in open boats-trips which gained dignity by the perpetual presence of danger. During these excursions, I passed again and again through the Rio Bertioga, a channel which separates the once populous and still luxuriant island of Santo Amaro from the mainland; and I landed, not unfrequently, at the ruin opposite the Forte da Bertioga. The stone-heap occupies the site where Hans Stade, the author of the following pages, served as gunner, and whence he was carried off captive by the cannibal savages, who, in those days lived alternately upon the sea-coast and the interior plateau. Of the wild tribes, not a living specimen remains; but, like the Guanches of Tenerife, they have left manifest traces of �red� blood in the veins of their modern successors. 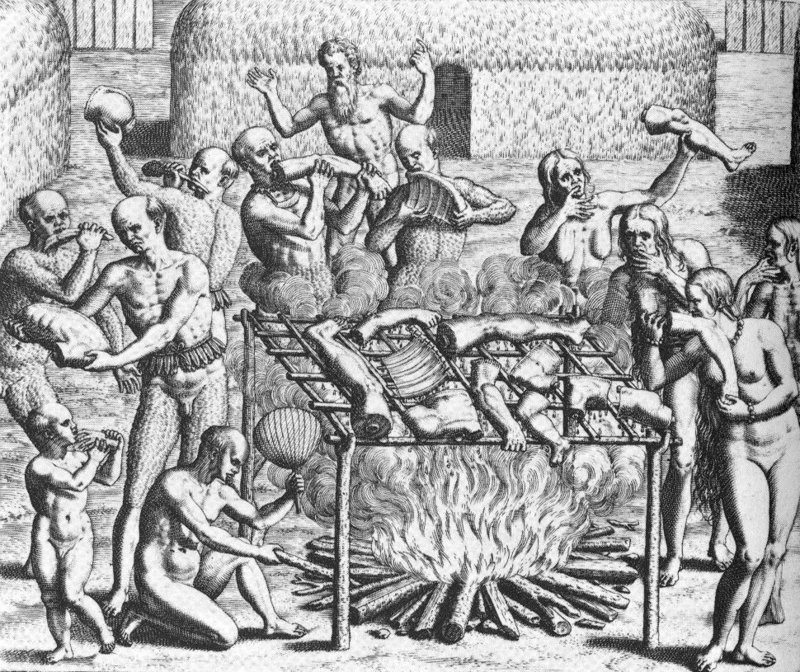 And, whilst their wigwams have long vanished from the earth's face, their enormous �kitchen middens", called by the natives Sambaqu�, and by the Portuguese Ostreiras, containing thousands of cubic feet, and composed chiefly of Venus (berbig�es), oyster and mussel shells, still stud the coast line and supply the granitic and primary regions with lime, which will presently be exhausted. Before my transfer from Santos to Damascus (1869), I had strongly recommended a friend, Albert Tootal, to expend the moments which he could spare from more important matters in translating Hans Stade. He followed my advice, and all those who take an interest in wild tribes, and especially in the Brazilian savages, owe him a debt of gratitude. Also at my suggestion, he preserved the chaste and simple style which best suits the subject; which accords with the character of the unlettered gunner, and which seems to vouch for the truth and the straightforwardness of the traveller. And the matter is not less interesting than the manner: it has the intrinsic value of ranking amongst the very few works written by eye-witnesses during the early sixteenth century, and it throws important light upon a point which unreasonable doubts have lately darkened. Not long ago we were assured that man does not outlive a hundred years, and the supposed error of Flourens led his correctors into an error still greater. After that freak, that �crotchet of criticism�, the existence of cannibalism, which seems at different ages of the world to have been the universal custom of mankind, was called in question. Hans Stade now steps forth and delivers his testimony about a people who were literally �fleshed with human meat". I must apologise to Mr. Tootal for long delay in my share of the work. The translation was finished in 1869, and it was taken to Syria for the purpose of adding an Introduction and a few explanatory Notes. But I unexpectedly found at Damascus duties and studies that occupied the whole of my time, and the various troubles to which allusion has been made in �Unexplored Syria�, left me as little will as leisure for the work. When suddenly recalled from my post, friends advised me to try the tonic effects of a summer in Iceland; in fact, until the present moment, when settled pro tempore at Trieste, I have lacked opportunity to fulfil my humble part of the contract. Mr. Tootal is alone answerable for the accuracy of his translation. To my responsibility fall the Introduction and the Notes. Its bibliographical portion was kindly undertaken by Clements R. Markham, C.B., etc., whose various literary avocations, to say nothing of official labours, enable him to be, like most hard workers perforce thrifty of their time, a man of comparative leisure. He has also the advantage of consulting libraries and of collecting viv� voce information �conditions hardly to be expected in a highly commercial sea-port.